Fill in your details below and we will let you know within 24 hours if we can get The River to you with haste! A new world opens before you with untouched land as far as the eye can see. Your boat glides up a river and you examine the banks, appreciating the beauty of your new home. Expand your territory, cultivate your land and exploit your resources to construct the buildings that will make your settlement the most impresive in the region. In The River, a worker placement game for 2-4 players designed by Ismaël Perrin and Sébastien Pauchon, players struggle to make the most amazing settlement of this new world. In order to outmatch your opponents, construct valuable buildings and cultivate your river banks into harmonious and productive tracts. Reserve resources, enlarge your territory, and block your competitors... Every decision counts in this fast and streamlined tile-placement game. But be careful, some of your pioneers will decide to settle along the way and the lack of a workforce could cost you the victory. Keep an eye on your opponents! If you aren't careful they'll claim the richest land before you even have a chance to set foot on the bank! The Worker Placement genre of games can be intimidating to a lot of new board gamers. More complex games can be very rewarding, but the amount of decisions a player needs to make when placing their workers or choosing a strategy to chase is overwhelming for the inexperienced. 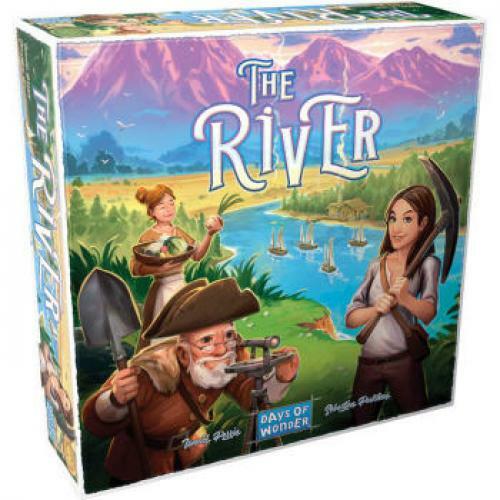 The River is perfect for players new to board gaming or just to worker placement games. Its streamlined rules and clean presenation lay everything out in a way that's clear and easy to understand with just enough complexity to introduce new players to worker placement concepts. If you're looking to get into board games and what something that won't overwhelm you with complex decisions, or if you want to introduce friends to worker placement games, you can't go wrong with The River. Set off and discover the fascinating world of worker placement games with this quick and streamlined introduction to the genre. Get your copy of The River today!